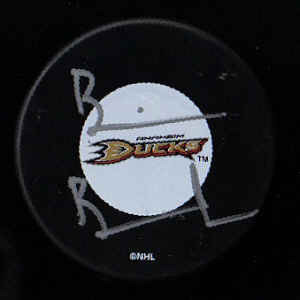 Going into this weekend's hounding, Colin has been asking if he could start getting some pucks signed. I figured that he's been out enough, building his collection of team sheets, that he's ready to try something different. And while he was more interested in snagging a goalie for the milestone, it was Brian Burke, Anaheim's general manager, who filled the role. To be honest, it didn't matter to Colin. What did matter, though, was that it made Colin's day. And, really, isn't that what's it all about?